The story is pretty interesting, but the musical numbers actually get in the way and distract from the plot moving forward. There’s a good story here, about an arrogant stage performer / playwright. George Cohan is a boy who grows up in the theater and is all the more cocky because of it. As a boy he has no shame in telling the world how great he thinks he is. He also has no problem running his mouth to the point of losing jobs for his family. As an adult, he’s not a whole lot better. He uses his power and fame to try and impress women in show them that he can get away with anything. But when things start to cool off him, George realizes that he has to change his ways. It’s a good, fun story. The problem is that the musical numbers keep getting in the way of it. The songs may be familiar, but the numbers here aren’t much fun and definitely throw the movie off balance. They also make the movie feel a little longer and more slow than it should be. As someone who genuinely likes musicals, at least musicals of today, there’s a whole lot to it that makes a musical work. It’s not just the song, but also the visuals including what the characters are doing, the choreography, and even the camera movement. There’s a reason why the opening number of La La Land, (the freeway traffic jam,) is the best number in the movie, or why Chicago translated so nicely to the big screen. And unfortunately with musicals from the first half of the twentieth century, they just weren’t up to par. 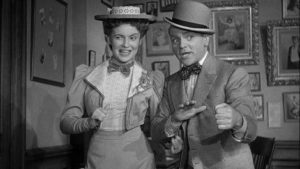 With Yankee Doodle Dandy, the James Cagney musical about a showman, the story is great. The musical numbers are what actually detract from keeping the flow of the story running smoothly. The movie is about an arrogant writer and performer of musical plays named George Cohan (James Cagney.) At the start of the film, he is an old man who has just come out of retirement to take on one more role. It is the role of president Franklin D. Roosevelt during the time of World War II. The war is going on all around them, in real life, and so this is a timely role that Cohan is afraid many will find offensive. He gets even more afraid when on opening night, he is met with a telegram summoning him to the White House. Cohan is being asked to meet with the president, himself, to discuss this new role. He arrives at the White House on a rainy night, having walked the streets to get there. Cohan shows up, sits down with the president, and learns that FDR is actually a fan of his. The president has been following Cohan’s career for some years now, and he asks Cohan to tell him his story. That’a when we flash back to the day Cohan was born. It’s July 4th. 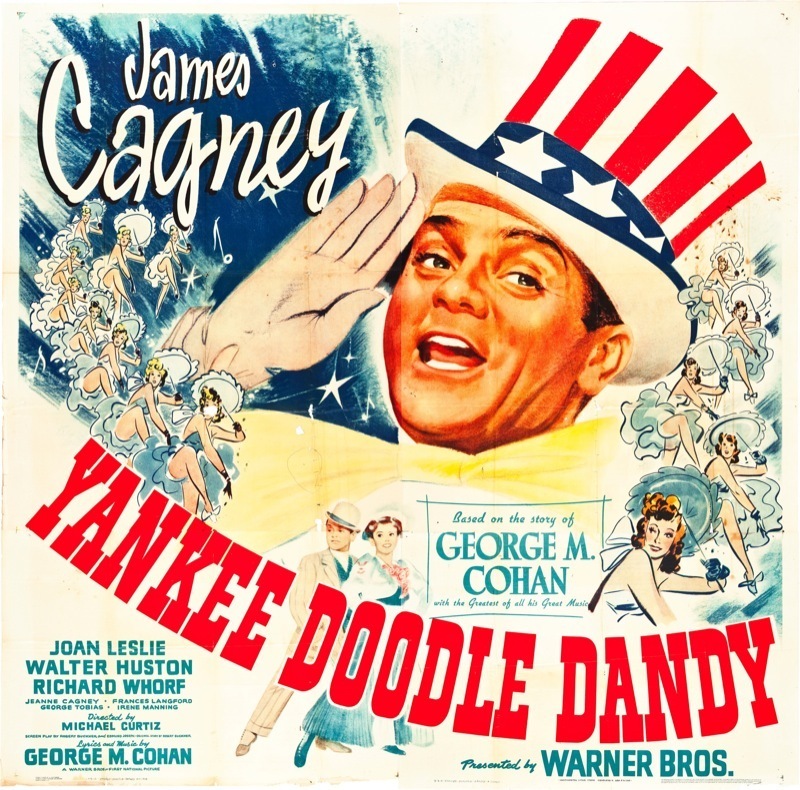 That’s significant because the movie is called Yankee Doodle Dandy and that song features the lyrics, “Born on the 4th of July.” But other than that, the scene of him being born doesn’t have much to do with anything, story-wise. Pretty soon, however, Cohan is a boy and he’s performing with his family. The team includes both of his parents and his sister. Together they make up The Four Cohan’s. The group does well and is very popular, but George, in particular is all anyone can really talk about. He is a multi-talented kid, doing all sorts of tricks, including playing the violin while it sits resting a top of his head. The fame and word of mouth go to Cohan’s head. First it’s just lines his character is saying in the show, like “I can lick any kid in this town.” Pretty soon, however, the actor starts to believe this sort of thing. He gives interviews and doesn’t hold back with any modesty about how good he thinks he is. The result is that when he goes outside one day, a whole bunch of kids are waiting there for him, and beat him up. But Cohan doesn’t exactly learn from that experience. When a big time producer comes to meet with Cohan’s father about a business opportunity, the father tells George to wait in the tub behind them. Then he shuts the curtain ton hide George from sight. The producer sits down with George’s father and makes him an offer. He wants to move the family to Boston to perform with some of the biggest names in the business. The pay will be great and the opportunity will be tremendous. The only catch is that they will be fourth billed, considering the other stars who they will be performing alongside. This is too much for young George to hear. He jumps out of the tub and starts berating the producer for not realizing how great they are. Especially since the Four Cohan’s have him, George, in their act. The producer storms out and George gets bent over the knee and hit by his father. Cohan’s arrogance continues when he is an adult. For a while, he can’t get any work. People know his name and don’t want to deal with him. When he does work, he continues to have a bad attitude of doing whatever he wants. At one point, he tries to impress an actress and tells her to go out on stage at a time she’s not supposed to and sing a song that she’s not on the program to sing. It reminds me of the Phillip Seymour Hoffman character, Sandy, in Along Came Polly. It doesn’t matter if it’s your song or someone else’s, or if it’s your part or someone else’s, with you, the rules don’t apply. Only the producer of the show sees this and steps in. He puts the actress in her place, and when Cohan jumps in and tells this man that he told her to do it, the producer lets him have it too. That’s when Cohan really stops working. People are just sick of the attitude and arrogance. He takes meeting after meeting, but is met with no success. And then Cohan has an idea. He takes a meeting with a producer at the same time as a rival playwright is meeting with the man, and instead of asking for a job, Cohan tells the producer that he’s got one. He tells the man, that he and this rival have just been hired by other producers to put on a play. He says that he can’t tell this producer anything about the play, because it is top secret, but thanks for his time, and it was nice meeting him. Talk about reverse psychology. First, he gets the other playwright, who knows that Cohan is full of it, to go along, and not call him out. Second, but doing this, he eliminates the competition. And lastly, (and most importantly,) he gets this producer interested. The man offers Cohan even more money than the other producers are (supposedly,) paying him, and it works. And just like, Cohan is back on top. He teams with this playwright and they become partners, taking on project after project. But Cohan isn’t passed the idea of selling others out to get ahead. At one point he writes a song for his actress / wife to perform, called “Mary.” But then he courts an actress to be in his show, and in order to reel her in, he offers her the song. Later on, his wife admits that she knew this was his plan all along, and so she didn’t have a problem with it. This sort of humor weaves itself into the movie nicely. The playful romantic banter is a little like Adam’s Rib or something like that. Another scene of this nature involves taking on a role that would involve moving. Cohan’s wife tells him she’s okay with him not taking the role if he doesn’t want to, even though he knows she wants him to take it. So he agrees to take it, for her. Then he calls up the producer and finds out that the producer already knew he was taking it. Cohan’s wife called him, just moments before, to tell him that Cohan would take it, and that she just needed to convince him first. So she knew where Cohan would end up on the situation, all along. But as much fun as these scenes are, the musical numbers are what cut off their flow. The songs themselves are fine, from “Over There,” to “You’re a Grand Old Flag.” They even do numbers like “Give My Regards To Broadway” and or course, “Yankee Doodle Dandy.” And yet, despite the familiarity of the songs, they really just prolong the movie. Maybe this one needed to be a little shorter. There are plenty of fun scenes, but the movie still feels a little too long and too slow, and the musical numbers don’t do it any favors.